When one walks past the Walpole Family Centre on Swan Street it is interesting to consider its origins. In 1972 a small group of mothers formed a committee to raise funds to establish Playgroup, as it was first called. The sum of $200 was needed. An anonymous donation of $50 set the ball rolling, with the rest raised by stalls and a bottle drive. November 1972 saw 10 youngsters aged from 3½ years attend the first Playgroup gathering. Kate O’Brien, a trained primary school teacher, was the supervisor and mothers were rostered to help. Mary Tapley, who had kindergarten experience in Albany, helped organise the group and relieved Kate when necessary. For the first two years the Country Women’s Association (CWA) made their premises available free of charge to the Playgroup. In return, parents painted the interior of the building and fenced the property. A dedicated building later became a priority and a fund-raising drive revved up. Donations from the Manjimup Shire Council, the Lotteries Commission, and the Recreation Council assisted the project. 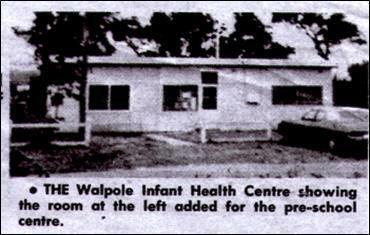 Then in February 1975 the Playgroup amalgamated with the Infant Health Clinic and became known as the Walpole Child Health and Pre-School Centre. It was therefore decided to use the funds on hand to extend to the already-established Infant Health Centre building on Vista Street in order to provide for 15 children. The work (pictured) was completed by Mr Ron Powley of Denmark in June 1975 at a cost of $3,800. The centre operated two mornings per week. After the Walpole Family Centre moved to its current premises on Swan Street, the little building on Vista Street, often called Vista Centre, had a variety of uses. As well as a popular venue for meetings it became a home for the Walpole Telecentre (now the Walpole Community Resource Centre). Meals on Wheels were also produced there for a time. Vista Centre was demolished to make way for the current Walpole Police Station and Walpole CRC moved to its new Walpole CENTRAL premises on Latham Avenue. This post is based on an article by Molly Smith that appeared in the October 30, 2013 edition of the Walpole Weekly as part of her “Looking Back with Molly” series.